I can smell Summer. Long days. Ocean swims. Sunshine. The sound of Cicadas. To welcome Summer i'm offering readers a chance to win a Planet Boab t-shirt. 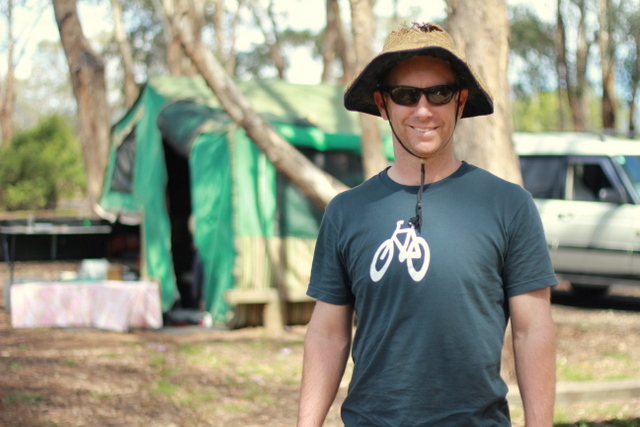 I shared my love for Planet Boab t-shirts earlier in the year. 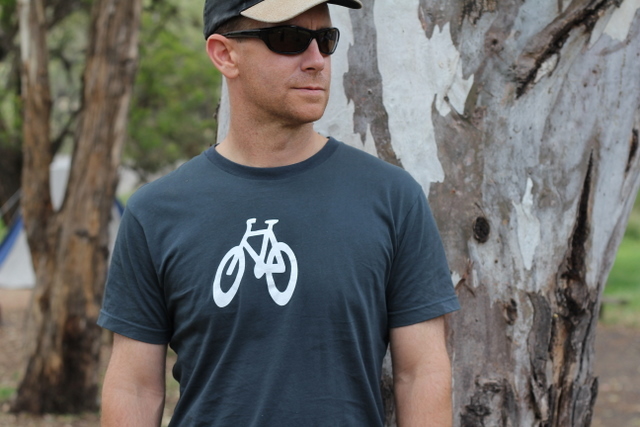 Planet Boab t-shirts are made here in Australia in a sweatshop free factory from 100% certified organic cotton and are hand printed using water based inks. Whats not to love! I treat myself to one new Planet Boab t-shirt each summer. I'm onto my third and my first is still going strong despite being worn literally over 100 times. It was one of my six for the six item or less challenge earlier this year and I still love it. Daddy Eco is now sharing in the Planet Boab love. Here he is in his new Cycle Path t-shirt. Want your very own Planet Boab t-shirt? 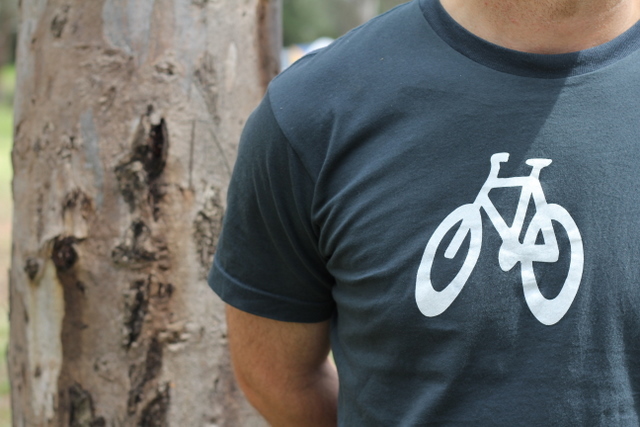 You can win a short sleeved Planet Boab t-shirt of your choice*. The winner is comment number 80: Nicole with her t-shirt design suggestion of a 'brass instrument like a trombone or trumpet, or a bat hanging upsidedown from a branch'. I LOVE the bat idea Nicole! Congratulations. I've just sent you an email. To enter head on over to Planet Boab, check out their range, and pop back here and leave a comment sharing which of their hand printed designs is your favourite. Those of you reading this by email will need to head on over to the blog (by clicking on the title) to leave a comment. Want a bonus entry? Leave an extra comment sharing a design idea for a new Planet Boab t-shirt. If Lisa from Planet Boab spots an idea she likes she's suggested she might make it a limited edition print and offer it first to Little Eco Footprint readers. That would be fun! Entries close midnight (Australian EDST) Monday 28th November 2011. The winner will be chosen by Random Number Generator and announced here in this post on the Tuesday morning. I'll contact the winner directly by email. *The prize is a gift voucher for $57AUD which covers the cost of a short sleeve t-shirt plus postage within Australia. International entries are welcome, although an international winner will need to pay the balance (above $57AUD) to cover international postage. I find myself wishing for more time far too often. Thankfully, I'm learning to act on these wise words..
...you just need to decide. I'm getting better at letting go of all those urgent tasks that don't really matter and focusing on what truly matters. Now, if only I could learn to not feel guilty about all that i've chosen not to do. p.s. Ethical clothing can be cute. In the above pic Little Eco wears a vintage top from the Reuse Center at Sandgate, a pre-loved skirt from Preloved Kidswear, and a handmade hair-clip from RedStitchDesign. Her pre-loved doll (an ebay find after she fell in love with a similar doll at childcare) wears a hand knitted outfit purchased from a small country town arts and craft co-op.